What do changes in the vertical structure of atmospheric temperature tell us about the causes of recent climate change? Are disaster scenarios about tipping points like release of methane from the Arctic a cause for concern? If emissions of greenhouse gases were stopped, would the climate return to the conditions of 200 years ago? 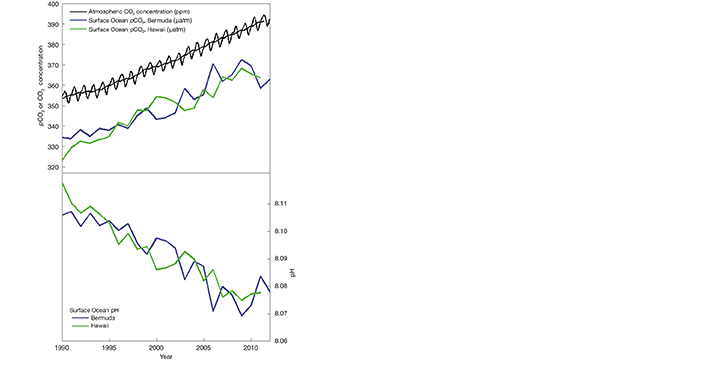 The clearest evidence for surface warming comes from widespread thermometer records. In some places, these records extend back to the late 19th century. Today, temperatures are monitored at many thousands of locations, over both the land and ocean surface. Indirect estimates of temperature change from such sources as tree rings and ice cores help to place recent temperature changes in the context of the past. In terms of the average surface temperature of Earth, these indirect estimates show that 1983 to 2012 was probably the warmest 30-year period in more than 800 years. A wide range of other observations provides a more comprehensive picture of warming throughout the climate system. For example, the lower atmosphere and the upper layers of the ocean have also warmed, snow and ice cover are decreasing in the Northern Hemisphere, the Greenland ice sheet is shrinking, and sea level is rising [Figure 1b]. These measurements are made with a variety of monitoring systems, which gives added confidence in the reality that Earth’s climate is warming. Yes. Earth’s average surface air temperature has increased by about 0.8 °C (1.4 °F) since 1900, with much of this increase taking place since the mid-1970s (Figure 1a). A wide range of other observations (such as reduced Arctic sea ice extent and increased ocean heat content) and indications from the natural world (such as poleward shifts of temperature-sensitive species of fish, mammals, insects, etc.) together provide incontrovertible evidence of planetary-scale warming. The expected changes in climate are based on our understanding of how greenhouse gases trap heat. Both this fundamental understanding of the physics of greenhouse gases and fingerprint studies show that natural causes alone are inadequate to explain the recent observed changes in climate. Natural causes include variations in the Sun’s output and in Earth’s orbit around the Sun, volcanic eruptions, and internal fluctuations in the climate system (such as El Niño and La Niña). Calculations using climate models have been used to simulate what would have happened to global temperatures if only natural factors were influencing the climate system. These simulations yield little warming, or even a slight cooling, over the 20th century. Only when models include human influences on the composition of the atmosphere are the resulting temperature changes consistent with observed changes. In nature, CO2 is exchanged continually between the atmosphere, plants and animals through photosynthesis, respiration, and decomposition, and between the atmosphere and ocean through gas exchange. A very small amount of CO2 (roughly 1% of the emission rate from fossil fuel combustion) is also emitted in volcanic eruptions. This is balanced by an equivalent amount that is removed by chemical weathering of rocks. The CO2 level in 2012 was about 40% higher than it was in the nineteenth century. Most of this CO2 increase has taken place since 1970, about the time when global energy consumption accelerated. Measured decreases in the fraction of other forms of carbon (the isotopes 14C and 13C) and a small decrease in atmospheric oxygen concentration (observations of which have been available since 1990) show that the rise in CO2 is largely from combustion of fossil fuels (which have low 13C fractions and no 14C). Deforestation and other land use changes have also released carbon from the biosphere (living world) where it normally resides for decades to centuries. The additional CO2 from fossil fuel burning and deforestation has disturbed the balance of the carbon cycle, because the natural processes that could restore the balance are too slow compared to the rates at which human activities are adding CO2 to the atmosphere. As a result, a substantial fraction of the CO2 emitted from human activities accumulates in the atmosphere, where some of it will remain not just for decades or centuries, but for thousands of years. Comparison with the CO2 levels measured in air extracted from ice cores indicates that the current concentrations are higher than they have been in at least 800,000 years (see Question 6). Human activities have significantly disturbed the natural carbon cycle by extracting longburied fossil fuels and burning them for energy, thus releasing CO2 to the atmosphere. The Sun provides the primary source of energy driving Earth’s climate system, but its variations have played very little role in the climate changes observed in recent decades. 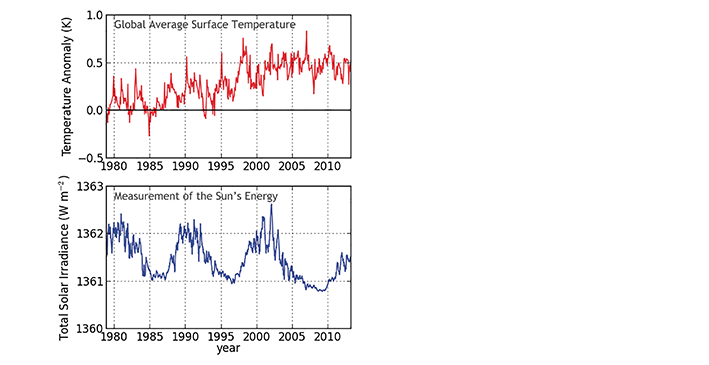 Direct satellite measurements since the late 1970s show no net increase in the Sun’s output, while at the same time global surface temperatures have increased [Figure 2]. In the early 1960s, results from mathematical/physical models of the climate system first showed that human-induced increases in CO2 would be expected to lead to gradual warming of the lower atmosphere (the troposphere) and cooling of higher levels of the atmosphere (the stratosphere). In contrast, increases in the Sun’s output would warm both the troposphere and the full vertical extent of the stratosphere. At that time, there was insufficient observational data to test this prediction, but temperature measurements from weather balloons and satellites have since confirmed these early forecasts. It is now known that the observed pattern of tropospheric warming and stratospheric cooling over the past 30 to 40 years is broadly consistent with computer model simulations that include increases in CO2 and decreases in stratospheric ozone, each caused by human activities. The observed pattern is not consistent with purely natural changes in the Sun’s energy output, volcanic activity, or natural climate variations such as El Niño and La Niña. Despite this agreement between the global-scale patterns of modelled and observed atmospheric temperature change, there are still some differences. The most noticeable differences are in the tropical troposphere, where models currently show more warming than has been observed, and in the Arctic, where the observed warming of the troposphere is greater than in most models. The observed warming in the lower atmosphere and cooling in the upper atmosphere provide us with key insights into the underlying causes of climate change and reveal that natural factors alone cannot explain the observed changes. The largest global-scale climate variations in Earth’s recent geological past are the ice age cycles (see infobox, p.B4), which are cold glacial periods followed by shorter warm periods [Figure 3]. The last few of these natural cycles have recurred roughly every 100,000 years. They are mainly paced by slow changes in Earth’s orbit which alter the way the Sun’s energy is distributed with latitude and by season on Earth. These changes alone are not sufficient to cause the observed magnitude of change in temperature, nor to act on the whole Earth. Instead they lead to changes in the extent of ice sheets and in the abundance of CO2 and other greenhouse gases which amplify the initial temperature change and complete the global transition from warm to cold or vice versa. Recent estimates of the increase in global average temperature since the end of the last ice age are 4 to 5 °C (7 to 9 °F). That change occurred over a period of about 7,000 years, starting 18,000 years ago. CO2 has risen by 40% in just the past 200 years, contributing to human alteration of the planet’s energy budget that has so far warmed Earth by about 0.8 °C (1.4 °F). If the rise in CO2 continues unchecked, warming of the same magnitude as the increase out of the ice age can be expected by the end of this century or soon after. This speed of warming is more than ten times that at the end of an ice age, the fastest known natural sustained change on a global scale. All major climate changes, including natural ones, are disruptive. Past climate changes led to extinction of many species, population migrations, and pronounced changes in the land surface and ocean circulation. The speed of the current climate change is faster than most of the past events, making it more difficult for human societies and the natural world to adapt. Measurements of air in ice cores show that for the past 800,000 years up until the 20th century, the atmospheric CO2 concentration stayed within the range 170 to 300 parts per million (ppm), making the recent rapid rise to nearly 400 ppm over 200 years particularly remarkable [Figure 3]. During the glacial cycles of the past 800,000 years both CO2 and methane have acted as important amplifiers of the climate changes triggered by variations in Earth’s orbit around the Sun. As Earth warmed from the last ice age, temperature and CO2 started to rise at approximately the same time and continued to rise in tandem from about 18,000 to 11,000 years ago. Changes in ocean temperature, circulation, chemistry and biology caused CO2 to be released to the atmosphere, which combined with other feedbacks to push Earth into an even warmer state. For earlier geological times, CO2 concentrations and temperatures have been inferred from less direct methods. Those suggest that the concentration of CO2 last approached 400 ppm about 3 to 5 million years ago, a period when global average surface temperature is estimated to have been about 2 to 3.5°C higher than in the pre-industrial period. At 50 million years ago, CO2 may have reached 1000 ppm, and global average temperature was probably about 10°C warmer than today. Under those conditions, Earth had little ice, and sea level was at least 60 metres higher than current levels. The present level of atmospheric CO2 concentration is almost certainly unprecedented in the past million years, during which time modern humans evolved and societies developed. The atmospheric CO2 concentration was however higher in Earth’s more distant past (many millions of years ago), at which time palaeoclimatic and geological data indicate that temperatures and sea levels were also higher than they are today. Our understanding of the physics by which CO2 affects Earth’s energy balance is confirmed by laboratory measurements, as well as by detailed satellite and surface observations of the emission and absorption of infrared energy by the atmosphere. Greenhouse gases absorb some of the infrared energy that Earth emits in so-called bands of stronger absorption that occur at certain wavelengths. Different gases absorb energy at different wavelengths. CO2 has its strongest heat-trapping band centred at a wavelength of 15 micrometres (millionths of a metre), with wings that spread out a few micrometres on either side. There are also many weaker absorption bands. As CO2 concentrations increase, the absorption at the centre of the strong band is already so intense that it plays little role in causing additional warming. However, more energy is absorbed in the weaker bands and in the wings of the strong band, causing the surface and lower atmosphere to warm further. No. Adding more CO2 to the atmosphere will cause surface temperatures to continue to increase. As the atmospheric concentrations of CO2 increase, the addition of extra CO2 becomes progressively less effective at trapping Earth’s energy, but surface temperature will still rise. These variations in the temperature trend are clearly evident in the observed temperature record [Figure 4]. Short-term natural climate variations could also affect the long-term human-induced climate change signal and vice-versa, because climate variations on different space and timescales can interact with one another. It is partly for this reason that climate change projections are made using climate models that can account for many different types of climate variations and their interactions. Reliable inferences about human-induced climate change must be made with a longer view, using records that cover many decades. Yes. The observed warming rate has varied from year to year, decade to decade, and place to place, as is expected from our understanding of the climate system. These shorterterm variations are mostly due to natural causes, and do not contradict our fundamental understanding that the long-term warming trend is primarily due to human-induced changes in the atmospheric levels of CO2 and other greenhouse gases. Decades of slow warming as well as decades of accelerated warming occur naturally in the climate system. Decades that are cold or warm compared to the long-term trend are seen in the observations of the past 150 years and also captured by climate models. Because the atmosphere stores very little heat, surface temperatures can be rapidly affected by heat uptake elsewhere in the climate system and by changes in external influences on climate (such as particles formed from material lofted high into the atmosphere from volcanic eruptions). More than 90% of the heat added to Earth is absorbed by the oceans and penetrates only slowly into deep water. A faster rate of heat penetration into the deeper ocean will slow the warming seen at the surface and in the atmosphere, but by itself will not change the long-term warming that will occur from a given amount of CO2. For example, recent studies show that some heat comes out of the ocean into the atmosphere during warm El Niño events, and more heat penetrates to ocean depths in cold La Niñas. Such changes occur repeatedly over timescales of decades and longer. An example is the major El Niño event in 1997–98 when the globally averaged air temperature soared to the highest level in the 20th century as the ocean lost heat to the atmosphere, mainly by evaporation. Recent studies have also pointed to a number of other small cooling influences over the past decade or so. These include a relatively quiet period of solar activity and a measured increase in the amount of aerosols (reflective particles) in the atmosphere due to the cumulative effects of a succession of small volcanic eruptions. The combination of these factors, both the interaction between the ocean and the atmosphere and the forcing from the Sun and aerosols, is thought likely to be responsible for the recent slowdown in surface warming. Despite the decadal slowdown in the rise of average surface temperature, a longer-term warming trend is still evident (see Figure 4). Each of the last three decades was warmer than any other decade since widespread thermometer measurements were introduced in the 1850s. Record heatwaves have occurred in Australia (January 2013), USA (July 2012), in Russia (summer 2010), and in Europe (summer 2003). The continuing effects of the warming climate are also seen in the increasing trends in ocean heat content and sea level, as well as in the continued melting of Arctic sea ice, glaciers and the Greenland ice sheet. No. Since the very warm year 1998 that followed the strong 1997-98 El Niño, the increase in average surface temperature has slowed relative to the previous decade of rapid temperature increases. Despite the slower rate of warming the 2000s were warmer than the 1990s. A short-term slowdown in the warming of Earth’s surface does not invalidate our understanding of long-term changes in global temperature arising from human-induced changes in greenhouse gases. Climate change means not only changes in globally averaged surface temperature, but also changes in atmospheric circulation, in the size and patterns of natural climate variations, and in local weather. La Niña events shift weather patterns so that some regions are made wetter, and wet summers are generally cooler. Stronger winds from polar regions can contribute to an occasional colder winter. In a similar way, the persistence of one phase of an atmospheric circulation pattern known as the North Atlantic Oscillation has contributed to several recent cold winters in Europe, eastern North America, and northern Asia. Atmospheric and ocean circulation patterns will evolve as Earth warms and will influence storm tracks and many other aspects of the weather. Global warming tilts the odds in favour of more warm days and seasons and fewer cold days and seasons. For example, across the continental United States in the 1960s there were more daily record low temperatures than record highs, but in the 2000s there were more than twice as many record highs as record lows. Another important example of tilting the odds is that over recent decades heatwaves have increased in frequency in large parts of Europe, Asia and Australia. Global warming is a long-term trend, but that does not mean that every year will be warmer than the previous one. Day to day and year to year changes in weather patterns will continue to produce some unusually cold days and nights, and winters and summers, even as the climate warms. Sea ice in the Arctic has decreased dramatically since the late 1970s, particularly in summer and autumn. Since the satellite record began in 1978 (providing for the first time a complete and continuous areal coverage of the Arctic), the yearly minimum Arctic sea ice extent (which occurs in early to mid-September) has decreased by more than 40% [Figure 5]. 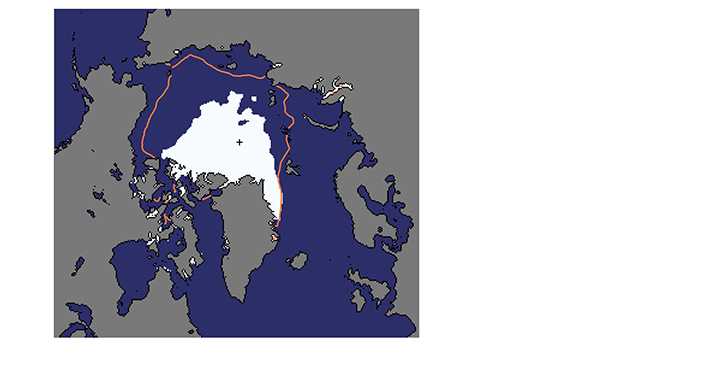 Ice cover expands again each Arctic winter but the ice is thinner than it used to be. Estimates of past sea ice extent suggest that this decline may be unprecedented in at least the past 1,450 years. The total volume of ice, the product of ice thickness and area, has decreased faster than ice extent over the past decades. Because sea ice is highly reflective, warming is amplified as the ice decreases and more sunshine is absorbed by the darker underlying ocean surface. Sea ice in the Antarctic has shown a slight increase in extent since 1979 overall, although some areas, such as that to the west of the Antarctic Peninsula, have experienced a decrease. Changes in surface wind patterns around the continent have contributed to the Antarctic pattern of sea ice change while ocean factors such as the addition of cool fresh water from melting ice shelves may also have played a role. The wind changes include a recent strengthening of westerly winds, which reduces the amount of warm air from low latitudes penetrating into the southern high latitudes and alters the way in which ice moves away from the continent. The change in winds may result in part from the effects of stratospheric ozone depletion over Antarctica (i.e., the ozone hole, a phenomenon that is distinct from the humandriven changes in long-lived greenhouse gases discussed in this document). However, shortterm trends in the Southern Ocean, such as those observed, can readily occur from natural variability of the atmosphere, ocean and sea ice system. This sea-level rise has been driven by (in order of importance): expansion of water volume as the ocean warms, melting of mountain glaciers in most regions of the world, and losses from the Greenland and Antarctic ice sheets. All of these result from a warming climate. Fluctuations in sea level also occur due to changes in the amounts of water stored on land. The amount of sea level change experienced at any given location also depends on a variety of other factors, including whether regional geological processes and rebound of the land weighted down by previous ice sheets are causing the land itself to rise or sink, and whether changes in winds and currents are piling ocean water against some coasts or moving water away. The effects of rising sea level are felt most acutely in the increased frequency and intensity of occasional storm surges. If CO2 and other greenhouse gases continue to increase on their current trajectories, it is projected that sea level may rise by a further 0.5 to 1 m (1.5 to 3 feet) by 2100. But rising sea levels will not stop in 2100; sea levels will be much higher in the following centuries as the sea continues to take up heat and glaciers continue to retreat. It remains difficult to predict the details of how the Greenland and Antarctic Ice Sheets will respond to continued warming, but it is thought that Greenland and perhaps West Antarctica will continue to lose mass, whereas the colder parts of Antarctica could start to gain mass as they receive more snowfall from warmer air that contains more moisture. Sea level in the last interglacial (warm) period around 125,000 years ago peaked at probably 5 to 10 m above the present level. During this period, the polar regions were warmer than they are today. This suggests that, over millennia, long periods of increased warmth will lead to very significant loss of parts of the Greenland and Antarctic Ice Sheets and to consequent sea level rise. Long-term measurements of tide gauges and recent satellite data show that global sea level is rising, with best estimates of the global-average rise over the last two decades centred on 3.2 mm per year (0.12 inches per year). The overall observed rise since 1901 is about 20 cm (8 inches) [Figure 6]. Direct observations of ocean chemistry have shown that the chemical balance of seawater has shifted to a more acidic state (lower pH) [Figure 7]. Some marine organisms (such as corals and some shellfish) have shells composed of calcium carbonate which dissolves more readily in acid. As the acidity of sea water increases, it becomes more difficult for them to form or maintain their shells. Warming due to the addition of large amounts of greenhouse gases to the atmosphere can be understood in terms of very basic properties of greenhouse gases. It will in turn lead to many changes in natural climate processes, with a net effect of amplifying the warming. The size of the warming that will be experienced depends largely on the amount of greenhouse gases accumulating in the atmosphere and hence on the trajectory of emissions [Figure 8]. If the total cumulative emissions since 1870 are kept below about 1 trillion (million million) tonnes of carbon, then there is a two-thirds chance of keeping the rise in global average temperature since the pre-industrial period below 2 °C (3.6 oF). However, over half this amount has already been emitted. Based just on the established physics of the amount of heat CO2 absorbs and emits, a doubling of atmospheric CO2 concentration from pre-industrial levels (up to about 560 ppm) would by itself, without amplification by any other effects, cause a global average temperature increase of about 1 °C (1.8 °F). However, the total amount of warming from a given amount of emissions depends on chains of effects (feedbacks) that can individually either amplify or diminish the initial warming. The most important amplifying feedback is caused by water vapour, which is a potent greenhouse gas in the atmosphere as warmer air can hold more moisture. Also, as Arctic sea ice and glaciers melt, more sunlight is absorbed into the darker underlying land and ocean surfaces causing further warming and further melting of ice and snow. The biggest uncertain factor in our knowledge of feedbacks is in how the properties of clouds will change in response to climate change. Other feedbacks involve the carbon cycle. Currently the land and oceans together absorb about half of the CO2 emitted from human activities, but the capacities of land and ocean to store additional carbon are expected to decrease with additional warming, leading to faster increases in atmospheric CO2 and faster warming. Models vary in their projections of how much additional warming to expect, but all such models agree that the overall net effect of feedbacks is to amplify the CO2-only warming by a factor of 1.5 to 4.5. Very confident. If emissions continue on their present trajectory, without either technological or regulatory abatement, then warming of 2.6 to 4.8 °C (4.7 to 8.6 °F) in addition to that which has already occurred would be expected by the end of the 21st century. Both theory and direct observations have confirmed that global warming is associated with greater warming over land than oceans, moistening of the atmosphere, shifts in regional precipitation patterns and increases in extreme weather events, ocean acidification, melting glaciers, and rising sea levels (which increases the risk of coastal inundation and storm surge). Already, record high temperatures are on average significantly outpacing record low temperatures, wet areas are becoming wetter as dry areas are becoming drier, heavy rainstorms have become heavier, and snowpacks (an important source of freshwater for many regions) are decreasing. These impacts are expected to increase with greater warming and will threaten food production, freshwater supplies, coastal infrastructure, and especially the welfare of the huge population currently living in low-lying areas. Even though certain regions may realise some local benefit from the warming, the long-term consequences overall will be disruptive. Yes. Even though an increase of a few degrees in global average temperature does not sound like much, global average temperature during the last ice age was only about 4 to 5 °C (7 to 9 °F) colder than now. Global warming of just a few degrees will be associated with widespread changes in regional and local temperature and precipitation as well as with increases in some types of extreme weather events. These and other changes (such as sea level rise and storm surge) will have serious impacts on human societies and the natural world. Comparisons of model predictions with observations identify what is well-understood and, at the same time, reveal uncertainties or gaps in our understanding. This helps to set priorities for new research. Vigilant monitoring of the entire climate system—the atmosphere, oceans, land, and ice—is therefore critical, as the climate system may be full of surprises. Together, field and laboratory data and theoretical understanding are used to advance models of Earth’s climate system and to improve representation of key processes in them, especially those associated with clouds, aerosols, and transport of heat into the oceans. This is critical for accurately simulating climate change and associated changes in severe weather, especially at the regional and local scales important for policy decisions. Simulating how clouds will change with warming and in turn may themselves affect warming, remains one of the major challenges for global climate models, in part because many cloud processes occur on scales smaller than the current models can resolve. Greater computer power may enable some of these processes to be resolved in future-generation models. Dozens of groups and research institutions work on climate models, and scientists are now able to analyse results from essentially all of the world’s major Earth-System Models and compare them with each other and with observations. Such opportunities are of tremendous benefit in bringing out the strengths and weaknesses of various models and diagnosing the causes of differences among models, so that research can focus on the relevant processes. 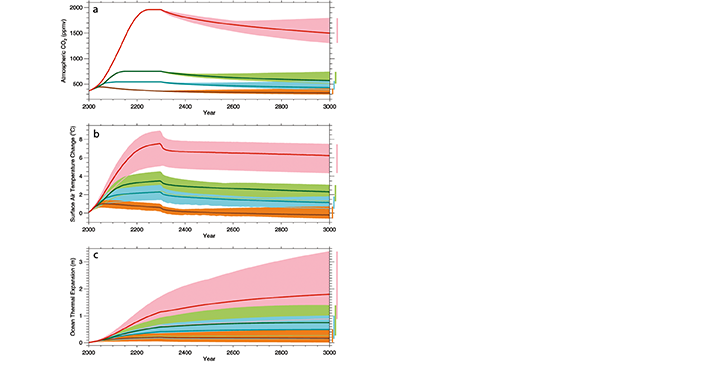 The differences among models allow estimates to be made of the uncertainties in projections of future climate change, and in understanding which aspects of these projections are robust. Studying how climate responded to major changes in the past is another way of checking that we understand how different processes work and that models are capable of performing under a wide range of conditions. Science is a continual process of observation, understanding, modelling, testing and prediction. The prediction of a long-term trend in global warming from increasing greenhouse gases is robust and has been confirmed by a growing body of evidence. Nevertheless, understanding (for example, of cloud dynamics, and of climate variations on centennial and decadal timescales and on regional-to-local spatial scales) remains incomplete. All of these are areas of active research. The composition of the atmosphere is changing towards conditions that have not been experienced for millions of years, so we are headed for unknown territory, and uncertainty is large. The climate system involves many competing processes that could switch the climate into a different state once a threshold has been exceeded. A well-known example is the south-north ocean overturning circulation, which is maintained by cold salty water sinking in the North Atlantic and which involves the transport of extra heat to the North Atlantic via the Gulf Stream. During the last ice age, pulses of freshwater from the ice sheet over North America led to slowing down of this overturning circulation and to widespread changes in climate around the Northern Hemisphere. Freshening of the North Atlantic from the melting of the Greenland ice sheet is however, much less intense and hence is not expected to cause abrupt changes. As another example, Arctic warming could destabilise methane (a greenhouse gas) trapped in ocean sediments and permafrost, potentially leading to a rapid release of a large amount of methane. If such a rapid release occurred, then major, fast climate changes would ensue. Such high-risk changes are considered unlikely in this century, but are by definition hard to predict. Scientists are therefore continuing to study the possibility of such tipping points beyond which we risk large and abrupt changes. Results from the best available climate models do not predict abrupt changes in such systems (often referred to as tipping points) in the near future. However, as warming increases, the possibilities of major abrupt change cannot be ruled out. If emissions of CO2 stopped altogether, it would take many thousands of years for atmospheric CO2 to return to ‘pre-industrial’ levels due to its very slow transfer to the deep ocean and ultimate burial in ocean sediments. Surface temperatures would stay elevated for at least a thousand years, implying extremely long-term commitment to a warmer planet due to past and current emissions, and sea level would likely continue to rise for many centuries even after temperature stopped increasing [Figure 9]. Significant cooling would be required to reverse melting of glaciers and the Greenland ice sheet, which formed during past cold climates. The current CO2-induced warming of Earth is therefore essentially irreversible on human timescales. The amount and rate of further warming will depend almost entirely on how much more CO2 humankind emits. Figure 1a. 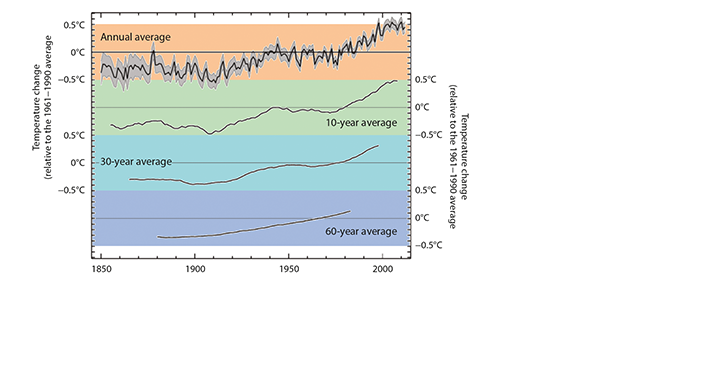 Earth’s global average surface temperature has risen as shown in this plot of combined land and ocean measurements from 1850 to 2012, derived from three independent analyses of the available data sets. 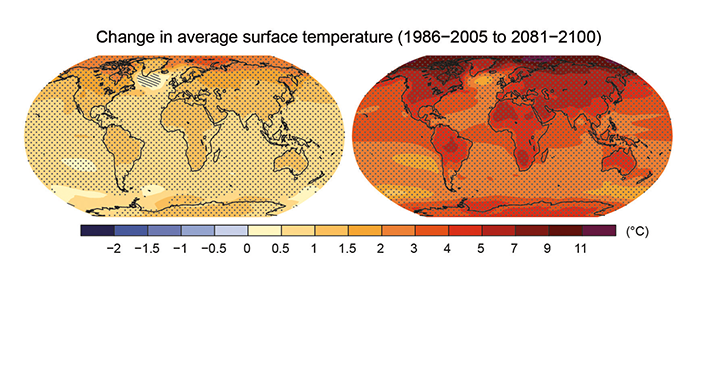 The temperature changes are relative to the global average surface temperature of 1961−1990. 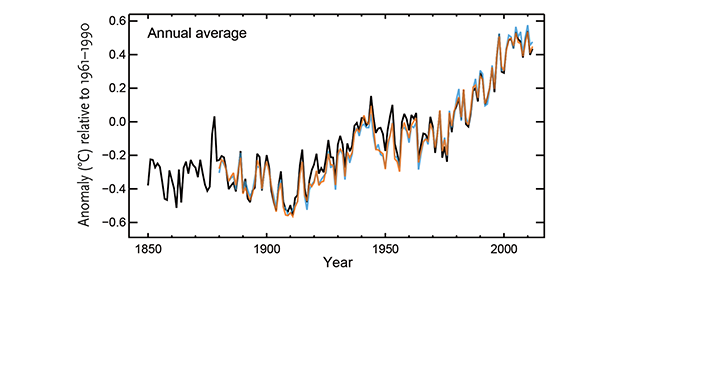 Source: IPCC AR5, data from the HadCRUT4 dataset (black), UK Met Office Hadley Centre, the NCDC MLOST dataset (orange), US National Oceanic and Atmospheric Administration, and the NASA GISS dataset (blue), US National Aeronautics and Space Administration. Figure 3. Data from ice cores have been used to reconstruct Antarctic temperatures and atmospheric CO2 concentrations over the past 800,000 years. Temperature is based on measurements of the isotopic content of water in the Dome C ice core. CO2 is measured in air trapped in ice, and is a composite of the Dome C and Vostok ice core. The current CO2 concentration (blue star) is from atmospheric measurements. The cyclical pattern of temperature variations constitutes the ice age/ interglacial cycles. 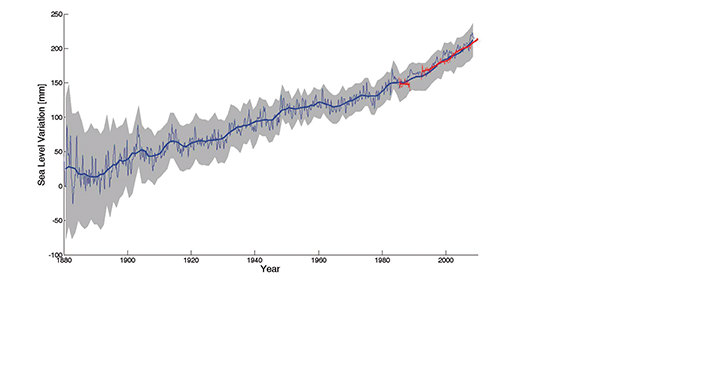 During these cycles, changes in CO2 concentrations (in blue) track closely with changes in temperature (in red). 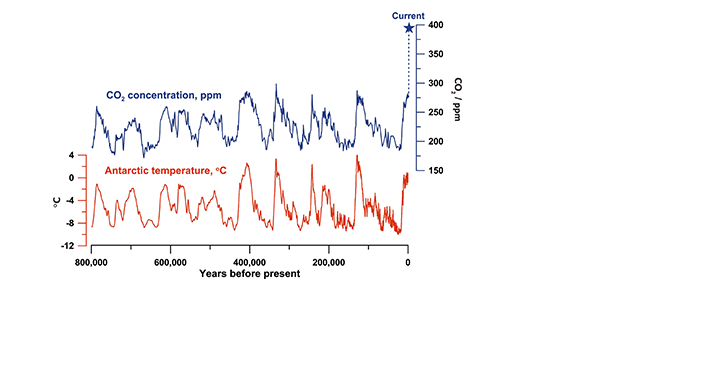 As the record shows, the recent increase in atmospheric CO2 concentration is unprecedented in the past 800,000 years. Source: Figure by Jeremy Shakun, data from Lüthi et al., 2008 and Jouzel et al., 2007. Figure 4. As the climate system varies naturally from year to year and from decade to decade, reliable inferences about human-induced climate change must be made with a longer view, using multi-decadal and longer records. Calculating a ‘running average’ over these longer timescales allows one to more easily see long-term trends. For the global average temperature for the period 1850-2012 (using the data from the UK Met Office Hadley Centre relative to the 1961-90 average) the plots show: (top) the average and range of uncertainty for annually averaged data; (2nd plot) the temperature given for any date is the average for the ten years about that date; (3rd plot) the equivalent picture for 30-year; and (4th plot) the 60-year averages. Source: Met Office, based on the HadCRUT4 dataset from the Met Office and Climatic Research Unit (Morice et al., 2012). Figure 7. As CO2 in the air has increased, there has been an increase in the CO2 content of the surface ocean (upper box), and a decrease in the seawater pH (lower box). Source: adapted from Dore et al. (2009) and Bates et al. (2012). 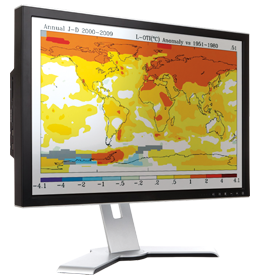 Why are computer models used to study climate change? The future evolution of Earth’s climate as it responds to the present rapid rate of increasing atmospheric CO2 has no precise analogues in the past, nor can it be properly understood through laboratory experiments. As we are also unable to carry out deliberate controlled experiments on Earth itself, computer models are among the most important tools used to study Earth’s climate system. Climate models are based on mathematical equations that represent the best understanding of the basic laws of physics, chemistry, and biology that govern the behaviour of the atmosphere, ocean, land surface, ice, and other parts of the climate system, as well as the interactions among them. The most comprehensive climate models, Earth-System Models, are designed to simulate Earth’s climate system with as much detail as is permitted by our understanding and by available supercomputers. The capability of climate models has improved steadily since the 1960s. Using physics-based equations, the models can be tested and are successful in simulating a broad range of weather and climate variations, for example from individual storms, jet stream meanders, El Niño events, and the climate of the last century. Their projections of the most prominent features of the long-term human-induced climate change signal have remained robust, as generations of increasingly complex models yield richer details of the change. They are also used to perform experiments to isolate specific causes of climate change and to explore the consequences of different scenarios of future greenhouse gas emissions and other influences on climate.